Once a ticket is closed, it cannot be altered or reopened. However, both the requester and you can create a follow-up request. This creates a new ticket that references the closed ticket and pulls data from the original ticket into the new ticket. Comments, the Priority and Type fields, and the Assignee or Group are not pulled from the original ticket. The channel for follow-up tickets is Closed ticket. Locate the closed ticket that you want to create a follow-up for. You can do this by locating the requester first and then selecting one of their closed tickets, by searching for the ticket number, or by creating a view for closed tickets and locating the ticket there. When you view a closed ticket, you'll see the option to create a follow-up ticket. A new ticket is created with the same data as the original ticket, excluding the Priority and Type fields. Note: If a user on the CC list replies to a closed ticket, the follow-up ticket will include the original requester and CCs. Update the ticket data as needed and then click Submit to save the new ticket. The requester will receive an email notification for the new ticket. If you haven't modified the default triggers of your account, this notification is created by the Notify requester of received request trigger. If i create a follow-up to a ticket, does that mean that the closed ticket - that is used in some custom statistics - will be overruled by the follow-up? Hello - if I have all end users of an organization set up to view each other's tickets, can an organization end user create a follow-up of another end user's ticket? If RequesterA creates the original ticket, can RequesterB create a follow-up? I wouldn't say "overruled". Once a ticket has been Closed, it can't be modified in anyway, so when a follow-up ticket is created it's a completely new ticket. The ticket field information is brought over from the original ticket, but it will count as a second ticket. For the use case you're describing, you'll either need to just add the serial number to your tickets going forward, or create follow-up tickets and exclude the original tickets from your reporting. So how would you omit the original ticket from the reporting, and only have the follow-up data included? Btw. It would be so much easier to give the option to Re-open the old ticket from the Closed state. I understand why you close them, i've read somewhere else it's due performance of the platform, but still - allowing your teams to reopen a case would be great, as a follow-up is something different. The first thing to bear in mind is that if you're doing any time-based reporting (ie: last seven days, etc), creating follow-up tickets to add the serial number may throw off your numbers, since those tickets were created after the original ticket. If you're using a single line custom text field, you can just create or modify a report to include tickets that have information in that custom field. Once the custom field has been created and tickets exist that have information in that field, and your Insights project has had time to sync up, you'll see that custom field listed as an option when you edit/build the report. Another option would be to just exclude all closed tickets from the report. Is there any way to create a trigger which will email the assignee of the original ticket when a follow-up is created? I can't think of a way this could be achieved, but perhaps someone here has ideas. @Kathryn. If you only have a few agents, perhaps 20 at most, then you could use triggers to add tags to the tickets as they are assigned to agents (removing any previous related tags at the same time). When a follow on ticket is created that tag would still be in place so you can use that to reassign the ticket. @Colin Thanks for the suggestion! Requester A create the original ticket, and then have Requester B create a follow-up. It does not appear that this is possible. Requester B can request to create a follow-up, but it will actually create a new ticket instead. I'm sorry I do not have better news for you on this one! If you have further questions, please don't hesitate to reach out to us! Is it possible to send me what was sent to Nina re: preserving all ticket fields on the follow-up ticket from the original? I checked Nina's ticket, and the advocate confirmed that it's not possible to preserve all ticket fields when a follow-up ticket is created. We do have a conversation about this in our Product Feedback forum, which you can find here: Follow up tickets should have inheritance from the original ticket's custom fields. There hasn't been any recent activity, but I'd encourage you to add your vote and use case to the conversation. Our Product Managers see each comment on those posts, and we take customer feedback into consideration as we work to improve Zendesk. Is there a way that you can amend a ticket so that it isn't a follow-up?? We have multiple users that raise tickets as a 'follow-up' when in fact they are not. They have been advised on how to raise tickets but yet they come through as 'follow-up' tickets. We have the same issue as Sharon - I have no idea why people do this, but anyway, we want all customer-initiated follow-ups to start afresh like regular tickets. We have found the same issue as Sharon and though many users will follow our directions to delete ticket-specific emails or suggested contacts in their email client, we still get a few users that just don't "get it". I would love a workaround for those handful of users that continue to open unrelated followups, which hopefully will remain a low percentage. I raised my request as a support ticket as Zendesk haven't updated the above thread since April 2016..
"While it's not possible to completely disable follow-up tickets, you can send a message to the requester when they reply to a closed ticket by creating a trigger. You could let the customer know for future reference to raise a brand new ticket if it's a separate issue. I've also taken a look in our Product Feedback discussions but was unable to find an existing discussion about disabling follow-up tickets. 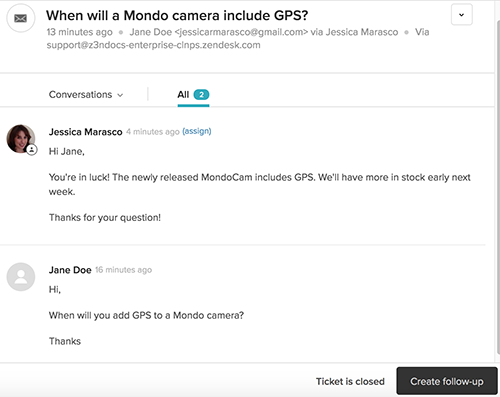 Since that forum is the primary channel used by our Product Management team and other Zendesk users to discuss possible new features and suggest workarounds, I highly encourage you to post your request there. I also recommend subscribing to the article so you'll be updated of any further comments. We truly value customer feedback and your voice and votes in the forums help influence future Zendesk functionality." I have a concern with how ZenDesk is looking at emails and considering it as a "follow-up" to a closed ticket. This creates potential privacy issue where internal staff communication are being shown to the customer. When a customer sends a support request we get a copy in our Outlook but our agents respond from the Zendesk panel. Now, one of the agents took the ticket and forwarded to other department, from inside Outlook, and he had changed the email subject line and removed ALL recipients then added the new recipients. Today, one of the recipients mentioned this is a serious privacy concern because recipients response actually triggered Zendesk to create a "follow-up" ticket which means original requester received a copy as well, even though the email subject is different and original requester nor the unique ticket identifier are on the TO/CC line. Is there an invisible tag that is stuck to a ticket once issued? If our agents need to communicate with other departments who aren't on zendesk are they to do that by attaching the zendesk ticket as an attachment rather than forward? There's content inside the email header that helps determine whether an email should be made into a follow-up ticket in Zendesk. I'd like some clarification on your workflow here. Why are your agents forwarding that email from Outlook after the ticket has been Solved and moved to Closed status? There could be another solution that will work better for your purposes here. We have integrated zendesk for some time now but many of our customers are still sending emails to personal email rather than our "support@company.com" address hence sometimes there is a need to forward. In the case I had mentioned before, the ticket itself had been resolved but one of our agents took an outlook copy of the ticket and removed all TO/CC leaving just the new recipient then forwarded it to our sales team to follow up on a sales opportunity but when the sales team responds back it somehow triggered an update to the ticket hence our customer received a copy of the email that could have had confidential information. Is the header information a hidden property of an email? We just found out the hard way that follow-up tickets do not inherit the group of the original. We had a ticket stuck in the twilight zone for close to three weeks as a result. Check your backstop assignment triggers for this condition! We checked for a custom field "tier" and had an instance where a follow-up was created on a closed escalation that had tier prepopulated, thus bypassing our backstop assignment trigger. Thanks for sharing that, Rob! Hi! Our customers or agents will not have a note or email from follow up tickets. What is wrong? You'll want to go in and check to make sure that you haven't changed or disabled any of your Triggers. Triggers are what actually send notifications from your Zendesk. It would be nice to create a follow up case also for tickets in any state, like open or solved tickets. My reason would be to create a pure internal ticket, so either to follow up something as the case towards the customer should stay solved and get closed or to fork the case so different internal work can be distributed. Thanks for the feedback. Unfortunately, our Product Managers don't often see feedback provided in the comments in Knowledge Base articles - there are just too many places and not enough hours in the day for them to get everywhere on our Help Center. I encourage you to post your feedback to the Product Feedback Community, which they do monitor and read on a regular basis. Have a great day, and happy Zendesking! When a customer replies to an email of an old ticket that was closed and Zendesk creates a new "follow up" ticket from the old ticket and pulls in "key data" from the old ticket into the new ticket...what exactly is all the key data? Precisely, I'd like to know if all old tags are automatically tagged in the new follow up ticket too? Thanks, Jarom. Yes, tags are pulled through to the new ticket. I'm trying to find some documentation on what other data is pulled through, but in the meantime, hopefully that's enough to work with! We have x amount of closed tickets that we need to bulk follow up. Other than clicking into each and creating a follow up, is there a simple way to achieve this? There's nothing built into the agent interface that will allow you to do this in bulk, but there is a "create many tickets" endpoint in our API that will let you get this done. The level of simplicity will depend on your level of programming knowledge, but provided you have the resources to do the API call, you can get it done pretty quickly! What is the difference between a Solved ticket and a Closed ticket? How can I manually close a ticket?